Every challenge has its rewards, and every opportunity has its tradeoffs. One of the tradeoffs I had counted on was that Kirstin would always be with us. Michael was an independent young man at an early age, playing with his friends all day. When we moved to Prescott Valley he became an adventurer, exploring the creeks and hills around our town. In high school, now a licensed driver, he spent time with his buddies or worked at various part-time jobs. He no longer accompanied us on family vacations. After high school, Michael took a job with the U.S. Forest Service as a firefighter. At first he remained in Chino Valley, but he was soon transferred to other ranger stations in remote areas of our large state. Eventually, he got married and became a parent himself. He had gradually become less and less a part of our daily lives, but Kirstin was always there. She was with us every day and everywhere we went. Other parents had to prepare for having their children move away, but not us. While we knew Kirstin would have a life of her own in some ways, I always assumed she would continue to live with us. The empty nest idea didn’t fully hit me for a few months. It was May and it was Mother’s Day. On any other Mother’s Day, Kirstin would have been parked outside our bedroom door, waiting for us to wake up and open the door so she could rush in present and card in hand. But on this particular Mother’s Day, there was no shuffling noise coming from under our door. It hit me like a ton of bricks. We were empty nesters. That was when the tears came. As parents, Craig and I are as proud of Kirstin and her accomplishments as we are of our son Michael. They have both made their own way in the world as strong, successful, independent adults. Kirstin knows her own mind and will stand up for what she thinks is best for her (even to her overbearing mother). Letting go is a very difficult thing to do, and I don’t think we have fully mastered it yet. Maybe we never will. But Kirstin is always patient with us and helps us learn to be better empty nesters. Kirstin’s Side of the Story: I like being independent. Growing up means having a lot of responsibilities. I budget my money carefully. I have lots of bills to pay. It is not always easy being an adult. I’m a good cook. I keep my house clean. I am a good shopper. All children have their families, even when they grow up. My mom and I play Pounce together, cook together, and spend time together. We don’t see each other every day, but that makes it more special when we are together. It has been over eleven years since Kirstin moved out of our home and into the mobile she shared with her grandmother. During that time, Kirstin has enjoyed her independence and grown into a remarkable adult. 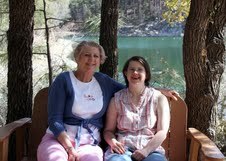 When we were helping her make decisions about what to do with her mobile home, there was a part of me that wanted so much to have her live with us again. But that wasn’t my decision to make. Kirstin has her own plans and dreams. Like all of us, she is working to make them come true. My role is to support her in this as I have always done.